DREAMSCAPE (AUS) (Bay 2005-Stud 2010). 4 wins to 1400m, AJC Stan Fox S., Gr.2. Sire of 114 rnrs, 53 wnrs, inc. SP Bugatty - Vanderbilt (Sing.) and of Royal Racer, E Master, Hammoon Dream, Dreamscope, Extreme Dreams, Artanis, Hammond Lane, Himpapawid, Lady Jane, Matagami, Red Dream, Dreamtimer, Eden Vale, Genoveffa, Settle Then Lift, Prince Planet, Ahmah Star, Ultimate Dreamer, Dream Piper, Monte Majura, Herecomes Thefuzz, Supreme Escape, etc. Vivid Dreamer (f. by Dreamscape). See below. UNENCUMBERED (Testa Rossa). 5 wins at 2, A$1,908,850, BRC BJ McLachlan S., Gr.3, GCTC Magic Millions 2YO Classic, RL, Wyong Magic Millions 2YO Classic, RL, ATC Ascend Sale Trophies 2YO P., Sharp 2YO P., 2d ATC Todman S., Gr.2, 3d ATC Men of League 2YO P. Sire. Suboric - Top Laurels (H.K.). 5 wins from 1300m to 1800m, A$103,205, HK$1,940,175, to 2017-18, ATC Club Marconi H., HKJC Japan Racing Association Trophy H., 2d HKJC Roselle H., Ferniehirst H., 3d HKJC Tai Lam Chung H., Grampian H.
Red Con. 2 wins at 2, STC Uncle Bucks Saloon 2YO H., 3d STC De Bortoli Emeri Sparkling H.
Good Boy. 2 wins at 1600m, 1650m, HKJC Wang Tak H., ING Agency 23 H., 2d HKJC Campus Circuit H., Albert H.
Basement. 6 wins from 1500m to 1800m to 2017-18 in Macau. FIRST COURSE (Snitzel). 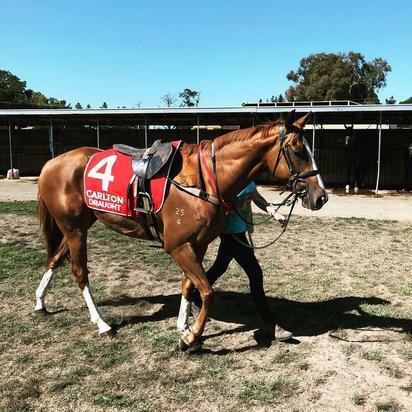 6 wins from 1300m to 1900m, A$376,350, Sale Cup, L, 2d VRC Poseidon S., L, Murray Cox 2YO H., MRC Sheen Group H., MVRC Chandler Macleod H., MRC Catanach's Jewellers Ladies' Day P., There's No Better Bet Than a Sportingbet H., Le Pine Funerals H., 3d MVRC Jeep Don't Hold Back H., MRC Le Pine Funerals H.-twice, 4th VRC Carbine Club S., Gr.3. Happy Cha Cha. 7 wins at 1650m, 1800m, HK$3,324,925, HKJC San Francisco H., Mount Butler H., Po Loi H., Positive Ageing H., Lung Mun H., HKU Space H., Willow H., 2d HKJC Audemars Piguet Royal Oak Offshore H., 3d HKJC Tsuen Wan H., Chow Tai Fook Perfect Moment H., Wai Yip H.
Gwemrae. 4 wins from 1350m to 2150m, TTC Magic Millions Race Night P., Carrick P., Devonport RC Tasracing.com.au H., 2d TTC Cascade Brewery H., Emirates Melbourne Cup Tour H., Tasmanian Hospitality Association H., 3d TTC Chris Reissig Builders H., Devonport RC Royal Rapture H.
Triple Strip. 3 wins-2 at 2-at 1100m, 1400m to 2018-19, TTC Meander Valley Council 2YO P., Tam O'Shanter Xmas Hamper 2YO H., Unique Doors H., 3d TTC Magic Millions 2YO Classic, Sheffield Newsagency H.
Far From It. Winner at 900m in Aust. Producer. Miss Margani. 4 wins to 1400m, 2d BRC Austereo H.
Smart 'n' Crafty. 3 wins-1 at 2-to 1400m, 2d BTC Air New Zealand 2YO P., 3d BRC BERT CIPQ H., Coca-Cola Amatil H., Queensland Weekender H., QTC Brisbane Bloodstock 2YO H., 4th BTC Doomben Slipper, L.
Childwick (Marscay). 3 wins to 1250m, STC Amaranth H., 2d SAJC Da Costa P., L, 3d NSW Tatt's RC New Years Gift H., STC Van Eyck H.
Real Say. 15 wins-3 at 2-to 1500m, A$239,530, BTC Crown Lager 2YO H., QTC Queensland Irish Association H., Ellerslie H., Silver Sharpe Welter H.
Merv's Wish. 6 wins to 1400m, BTC Ten Thousand Room H., 2d QTC Prince Gauntlet H., Innisfree H., 3d QTC Gallipoli Barracks Enoggera H.
Concise. 2 wins. See above. Masterpiece. Winner at 2, MVRC Night Patrol 2YO H., 2d VATC Wellington H., 3d VATC Cambria H., MVRC Lintas Australia Day H. Sire. Yeager. 2 wins at 1600m, 1800m, A$106,500, BRC Queensland Breeders TBQA H., 2d BRC BMAG 2YO H.
Bugatty - Vanderbilt (Sing.) (Dreamscape). 3 wins-1 at 2-at 1000m, A$131,575, S$54,000 in Aust. and Singapore, VRC Better Beyond 2YO P., MVRC TCL 4K UHD TV H., 2d MRC Chairman's S., Gr.3.